Don’t ask me how many of these I ate for breakfast on Sunday morning. I don’t want to talk about it. I mean, put yourself in my position. You’re a food blogger. 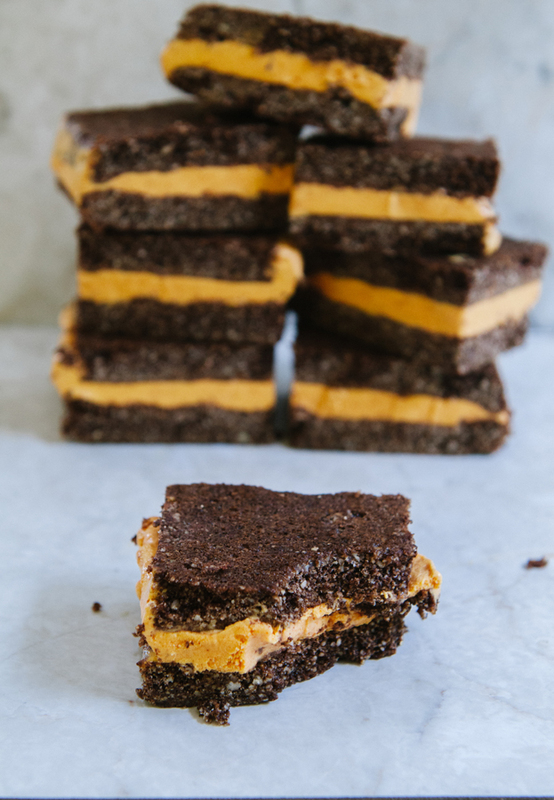 You are waking up early to make ice-cream sandwiches because you have to photograph them while there is still enough light outside. We lose light fast this time of year. You cut these beauties up. You stack them. You photograph them. They start getting all melty. You shove one in your mouth to save it from its melty self. You take a bite and get pumpkin ice cream all over your chin and in the ends of your hair. You could just put them back in the freezer, but you’ve already come this far. Just finish the dang ice cream sandwich. It’s really good. I wish I had an excuse for housing a second ice cream sandwich before 10am. 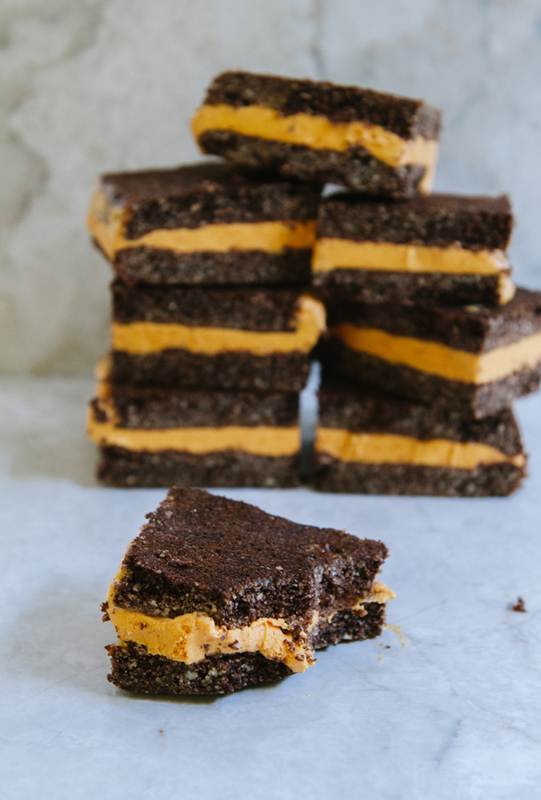 The only thing that I can come up with is a simple “Um…they’re like REALLY good.” Or, we could just chalk it up to BIRTHDAY WEEK! Let’s go with that. 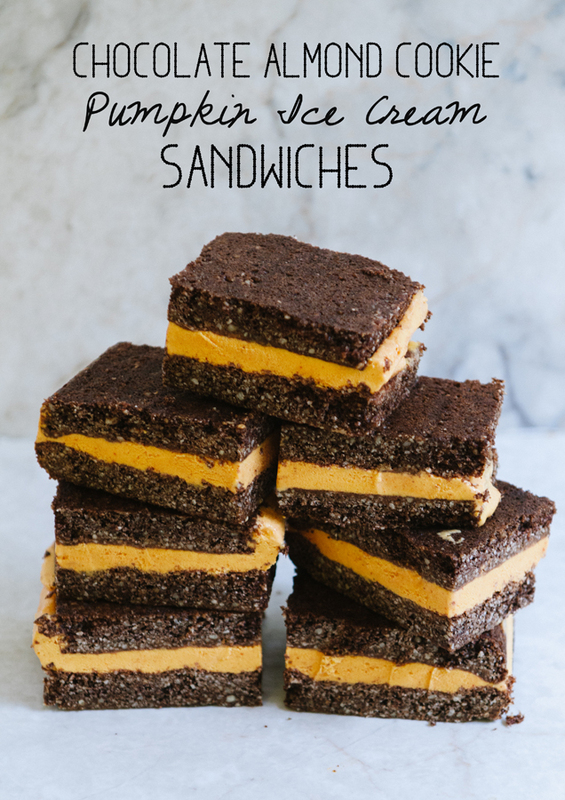 OR, I could just change the name of these to “Ice Cream Breakfast Sandwiches”. Totally a thing. I’ve lived it. That pumpkin ice cream that they are slingin’ at Trader Joes is bonkers. Don’t have a Trader Joes near you? No probs. You can sub out the ice cream in this recipe with ANY ice cream of your choosing. We’re not picky here. Can we get on with the recipe before I accidentally tell you how I ate donuts for dinner last night? #Whoops. Let’s just say that Birthday Week will be followed by some serious veggie therapy. Until then… let’s party. Step one: You’re going to make a giant cookie It doesn’t have to be a perfect rectangle, but you just do the best you can. Try to spread it out evenly on your baking sheet. You are going to have a chance to square up the ends later. Btw, “squaring up the ends” is total code for “extra bits of cookie for you face”. If you are uncomfortable with either of those terms, you can just call it “recycling”. Now you sounds really green and have a legit worldly excuse to eat the end pieces. Don’t waste them. Chocolate almond cookies are no joke. They are firm yet chewy… drool. Once your cookie has cooled completely you are going to cut it in half. Try to make the halves symmetrical, as you’re going to make a sandwich and don’t want one half to be way bigger than the other. That would be messy. Square up your ends. “Recycle” those end cookies as you see fit. Soften up your ice cream and then go to town. This is the point in the process where I realized that I didn’t own an ice cream scoop (REALLY?!?!). Yes, I’m a food blogger. Don’t worry, I’m totally a professional. I used a large serving spoon like a boss. Now, sandwich up those cookies. Layer your cookie layer on top of the ice cream and cookie layers. 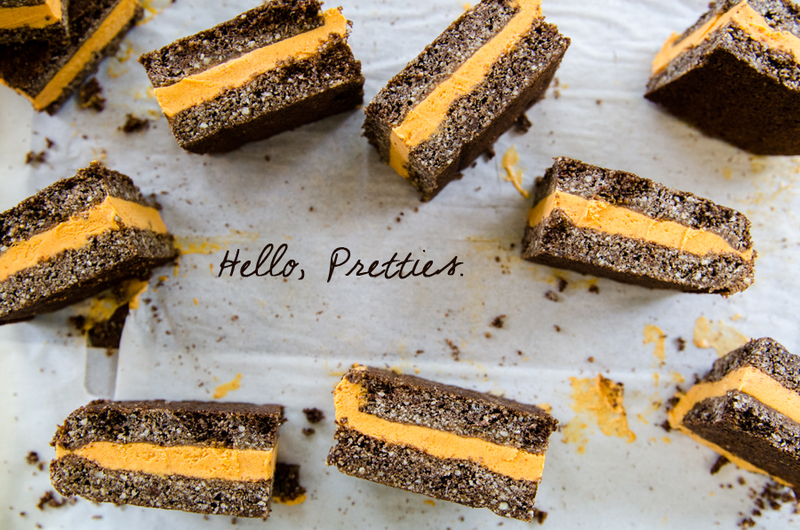 Oh, look… I spy some extra cookie crumbles. Now, use your child-like chubby mitts for hands to gently press that top layer down. Oh, what’s that? You just have normal person hands? No problem. I will allow you to borrow mine. After some freezer time, you are ready to slice them up. Cut them up into little squares. Bonus points it you leave it whole and just start eating it from one end. If you do that, please send me a video. Thank you. In a large mixing bowl combine your almond flour, baking soda, salt, arrowroot powder and cocoa powder. Whisk until it is well combined. In a separate bowl combine your melted coconut oil, maple syrup and vanilla extract. Whisk until it all comes together. Add your wet ingredients into your dry ingredients and mix together well with a spoon or baking spatula. Make sure you don't have any dry pockets. 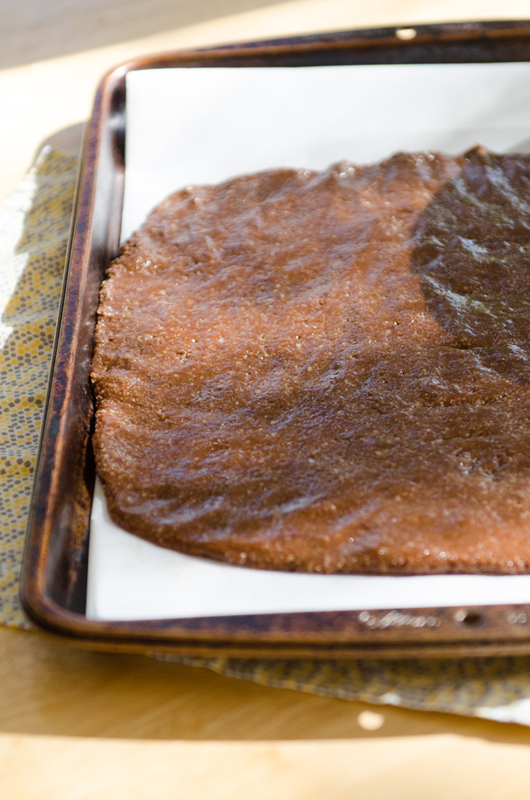 Spread your cookie batter out on the parchment paper. Try to form it into a rectangle. It doesn't have to be perfect, as you can square out your ends later, but try to aim for a rectangle shape. Make sure the batter is spread out evenly so that it will cook evenly. Using your spatula, or a clean set of hands, smooth out your batter. Bake for 10-15 minutes. They are done when the top of the cookie starts to look dry and begins to crack at the surface. Be careful not to overcook. Let the cookie cool on the baking sheet for up to an hour. You want to make sure that your cookie has completely cooled before you try to assemble your ice cream sandwiches. 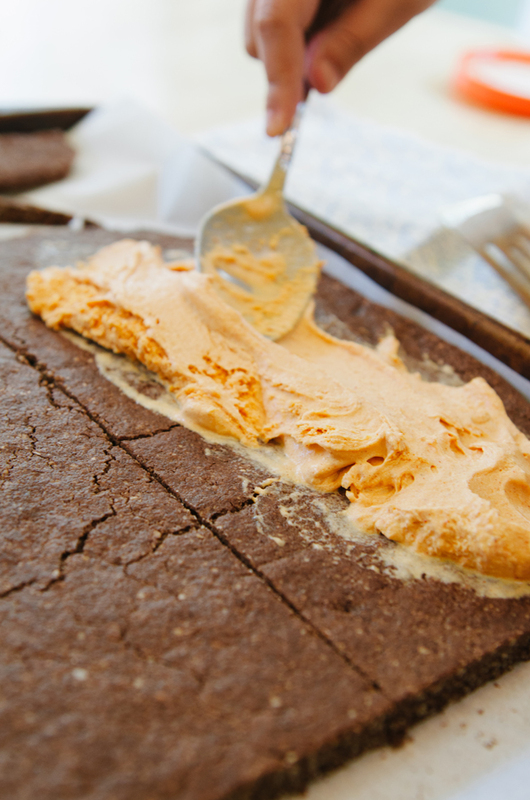 Once your cookie has cooled, remove your ice cream from the freezer and allow it to soften to a point where it is very spreadable. Using a sharp knife, cut your cookie vertically down the middle to create two even halves. Square up your ends. Scoop and spread your ice cream to cover one of your cookie halves. You are going to want a decently thick layer of ice cream. I would aim to have at least a 1/2 an inch thickness evenly spread out over the entire cookie. Once you have gotten your desired ice cream layer, carefully flip the other half of your cookie onto the ice cream layer, creating a sandwich. Gently press down with your hands to make sure that the top cookie is gently adhered to the ice cream. Place the ice cream sandwich as is in the freezer for several hours or up to overnight. You want to make sure that the ice cream has completely solidified again and is no longer melted. 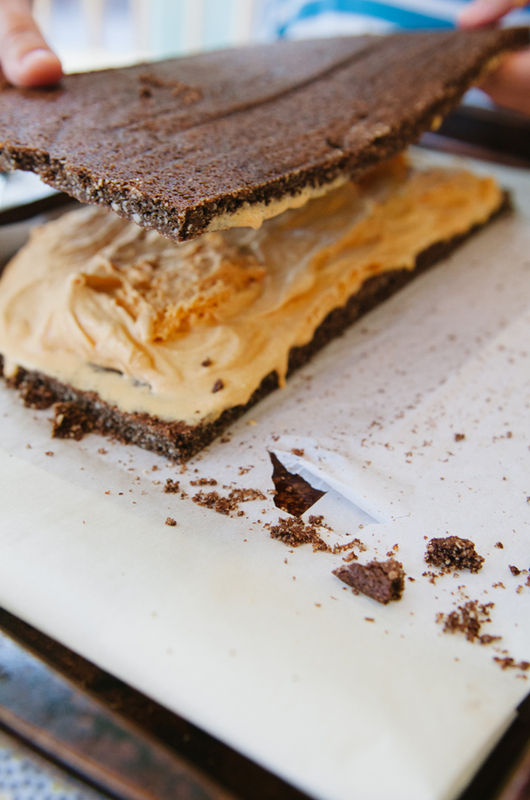 Once your ice cream has completely firmed up, you are ready to cut your ice cream sandwiches. 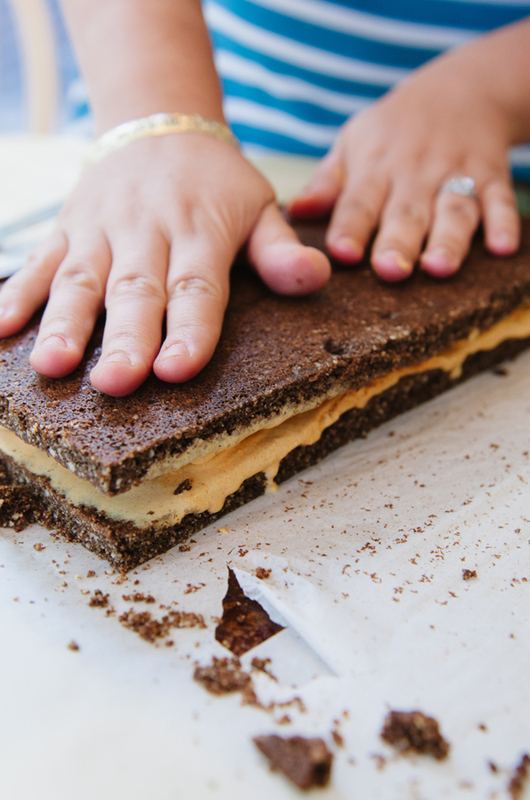 With a sharp knife cut the big ice cream sandwich into tinier and more manageable ice cream sandwiches. I cut strips lengthwise and the cut squares from those strips. Now, you are ready to enjoy! Try not to eat at least two. I dare you. ? 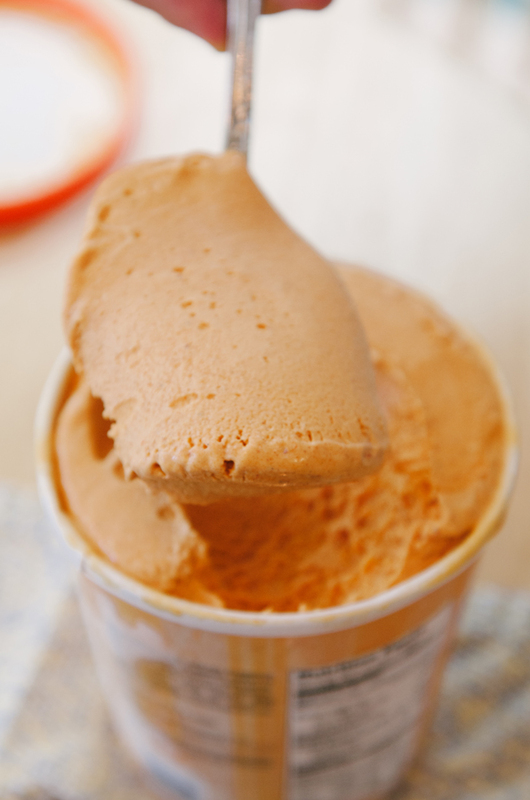 I have this pumpkin ice cream in my freezer right now. this looks so decadent!! I can’t blame you for eating ice cream sandwiches for breakfast.